"Pulse (legume)" redirects here. For the seed of one of several genera of Fabaceae, see Bean. A legume (/ˈlɛɡjuːm, ləˈɡjuːm/) is a plant in the family Fabaceae (or Leguminosae), or the fruit or seed of such a plant (also called a pulse). Legumes are grown agriculturally, primarily for human consumption, for livestock forage and silage, and as soil-enhancing green manure. Well-known legumes include alfalfa, clover, peas, chickpeas, lentils, lupin bean, mesquite, carob, soybeans, peanuts and tamarind. Legumes produce a botanically unique type of fruit – a simple dry fruit that develops from a simple carpel and usually dehisces (opens along a seam) on two sides. A common name for this type of fruit is a pod, although the term "pod" is also applied to a number of other fruit types, such as that of vanilla (a capsule) and of the radish (a silique). The term pulse, as used by the United Nations' Food and Agriculture Organization (FAO), is reserved for legume crops harvested solely for the dry seed. This excludes green beans and green peas, which are considered vegetable crops. Also excluded are seeds that are mainly grown for oil extraction (oilseeds like soybeans and peanuts), and seeds which are used exclusively for sowing forage (clovers, alfalfa). However, in common usage, these distinctions are not always clearly made, and many of the varieties used for dried pulses are also used for green vegetables, with their beans in pods while young. Grain legumes are cultivated for their seeds, which are used for human and animal consumption or for the production of oils for industrial uses. Grain legumes include beans, lentils, lupins, peas, and peanuts. Legumes are a significant source of protein, dietary fiber, carbohydrates and dietary minerals; for example, a 100 gram serving of cooked chickpeas contains 18 percent of the Daily Value (DV) for protein, 30 percent DV for dietary fiber, 43 percent DV for folate and 52 percent DV for manganese. Like other plant-based foods, pulses contain no cholesterol and little fat or sodium. Legumes are also an excellent source of resistant starch which is broken down by bacteria in the large intestine to produce short-chain fatty acids (such as butyrate) used by intestinal cells for food energy. Preliminary studies in humans include the potential for regular consumption of legumes in a plant-based diet to reduce the prevalence or risk of developing metabolic syndrome. There is evidence that a portion of pulses (roughly one cup daily) in a diet may help lower blood pressure and reduce LDL cholesterol levels, though there is a concern about the quality of the supporting data. Forage legumes are of two broad types. Some, like alfalfa, clover, vetch (Vicia), stylo (Stylosanthes), or Arachis, are sown in pasture and grazed by livestock. Other forage legumes such as Leucaena or Albizia are woody shrub or tree species that are either broken down by livestock or regularly cut by humans to provide livestock feed. Legumes base feed fed to animals improves animal performance compared to diets of perennial grass diet. Factors that attribute towards such result: larger consumption, quicker rate of digestion and feed conversion rate efficiency. In many traditional and organic farming practices, crop rotation involving legumes is common. By alternating between legumes and non-legumes, sometimes planting non-legumes two times in a row and then a legume, the field usually receives a sufficient amount of nitrogenous compounds to produce a good result, even when the crop is non-leguminous. Legumes are sometimes referred to as "green manure". Sri Lanka developed the farming practice known as coconut-soybean intercropping. Grain legumes are grown in coconut (Cocos nuficera) groves in two ways: intercropping or as a cash crop. These are grown mainly for their protein, vegetable oil and ability to uphold soil fertility. However, continuous cropping after 3-4 years decrease grain yields significantly. The type of crop(s) grown or animal rearing will be dependent on the farming system, either vegetables, tubers, grains, cattle etc. In cattle rearing, legume trees such as Gliricidia sepium can be planted along edges of field to provide shade for cattle, the leaves and bark are often eaten by cattle. Green manure can also be grown between periods when crops of economic importance are harvested prior to the next crops to be planted. Archaeologists have discovered traces of pulse production around Ravi River (Punjab), the seat of the Indus Valley Civilisation, dating to c. 3300 BCE. Meanwhile, evidence of lentil cultivation has also been found in Egyptian pyramids and cuneiform recipes. Dry pea seeds have been discovered in a Swiss village that are believed to date back to the Stone Age. Archaeological evidence suggests that these peas must have been grown in the eastern Mediterranean and Mesopotamian regions at least 5,000 years ago and in Britain as early as the 11th century. But one particular bean has become the leading legume planted worldwide, the soybean. It was first domesticated around 11000 BC in China, a descendant of the wilde vine Glycine soja. Domesticated soybean was introduced to the USA (Philadelphia) by Benjamin Franklin from France in 1804. Henry Ford, a vegetarian, was the first person to use soybeans for large-scale industrial purposes. Concentrating on his company, from 1932 to 1933 he invested over 1 million dollars in research on soybeans. Prior to WWII, 40% of cooking oil was imported into the US. When the war came, supply routes were disrupted, which encouraged the soybean culture in the US. Due to the years of research done by Henry Ford, the domestic soybean oil industry was born. Between 1970 and 1976, soybean production increased approximately 30%. Oil that yield from soybean in bulk, average about 18%. Its modern day usage ranges from margarine,salad oils, shortening and the previously mentioned cooking oil. Legumes are widely distributed as the third-largest land plant family in terms of number of species, behind only the Orchidaceae and Asteraceae, with about 751 genera and some 19,000 known species, constituting about seven percent of flowering plant species. India is the world's largest producer as well as consumer of pulses. In order to meet its large domestic demand for pulses, India has to import the produce from other countries despite its large production. In many developing countries it is a cash crop for about 700 million smallholders with an estimated value of US $31 billion annually. Export of soybean 83.8% , common bean 8.8%, peanut 4.9%, and chickpea 2.4%. an increase in the demand for legumes consumption is on the rise with the public becoming more educated about eaten more beans gives better health versus eaten meat protein. It is expected that the world population will increase by 40%, thus a 70% increase in food production by 2050. Over the years there has been decrease rain falls in areas of production this stretches also to competition for land and urban development. Water is very crucial for plant growth and development. The limitation of water and the fluctuating condition often put productivity at low. 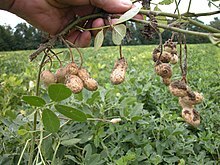 Ground nut yield in India is from 550 and 1100 kg ha-1, this is attributed to annual rain fall fluctuation. Seed viability decreases with longer storage time. Studies done on Vetch, Horse beans, and peas show that they last about 5 years in storage. Environmental factors that are important in influencing germination are relative humidity and temperature. Two rules apply to moisture content between 5 and 14 percent: the life of the seed will last longer if the storage temperature is reduced by 5 degree celsius. Secondly, the storage moisture content will decrease if temperature is reduced by 1 degree celsius. A common pest of grain legumes that is noticed in the tropical and subtropical Asia, Africa, Australia and Oceania are miniscule flies that belong to the family Agromyzidae, dubbed "bean flies". They are considered to be the most destructive. The host range of these flies is very wide amongst cultivated legumes. Infestation of plants starts from germination through to harvest, and they can destroy an entire crop in early stage. Black bean aphids are a serious pest to broad beans and other beans. Common host for this pest are fathen, thistle and dock. Pea and Bean Weevil: damages by these two culprits are characterised by leaf margins having semi-circular notches. Stem Nematode: there are many different Nematodes; they are very widespread but will be found more frequently in areas where host plants are grown. Anthracnose, caused by Colletotrichum trifolii, Common leaf spot caused by Pseudomonas syringae pv. syringae, Crown wart caused by Physoderma alfalfae, Downy mildew caused by Peronospora trifoliorum, Fusarium root rot caused by Fusarium spp, Rust caused by Uromyces striatus, Sclerotina Crown and stem rot caused by Sclerotinia trifoliorum, Southern blight caused by Sclertium rolfsii , Pythium root rot (browning root rot) caused by Pythium spp, Fusarium wilt caused by Fusarium oxysporum, Root knot, agent Meloidogyne hapla. These are all classified as Biotic problems. Abiotic Problems: Nutrient deficiency(ies) (nitrogen, phosphorus, potassium, copper, magnesium, manganese, boron, zinc), pollutants (air, water, soil, pesticide injury, fertilizer burn), toxic concentration of minerals, and unfavorable growth conditions. There are three main factors that contribute to the success of any plant disease: it must have a host (susceptible plants), the right environment, and a pathogen. With any one of the three factors being eliminated there will be no disease.To help achieve this, different approaches can be taken to mitigate its severity before it's too late. Control, diseases in plants should be kept below severity line at which it may be of economical importance, one can reduce the inoculum or slow the rate of its increase in plants. There are some principles that are etiological to control plant diseases: exclusion,eradication,therapy and resistant variety. Legumes can either be self-pollinated or cross-pollinated. Pollination serves the purpose for the continuation of the species and its genetic materials to its off-spring. Self-pollination limits the capability for genetic variation, whereas for cross-pollination the opposite is true. Some tropical legumes that are closely self-pollinated are: Macroptilium atropurpureum cv., Siratro,M. lathyroides, Centrosema pubescens, Neonotonia wightii, and Lotononis bainesii. However, the autogamous annual Stylosanthes humilis proved otherwise by adapting a response to changing conditions during an experiment, and was found to be composed of several genotypes showing heterogeneity. Two legumes used for pasture with cross-pollination are: Desmodium intortum and Desmodium uncinatum. When the flower is opened, this is the only time fertilization will take place. These two species' characteristics vary in morphology and ruggedness. The International Year of Pulses 2016 (IYP 2016) was declared by the Sixty-eighth session of the United Nations General Assembly. The Food and Agriculture Organization of the United Nations was nominated to facilitate the implementation of IYP 2016 in collaboration with governments, relevant organizations, non-governmental organizations and other relevant stakeholders. Its aim was to heighten public awareness of the nutritional benefits of pulses as part of sustainable food production aimed towards food security and nutrition. IYP 2016 created an opportunity to encourage connections throughout the food chain that would better use pulse-based proteins, further global production of pulses, better use crop rotations and address challenges in the global trade of pulses. ^ "What is a Pulse?". Pulse Canada. Pulse Canada. Retrieved 26 June 2016. ^ "List of Grain Legumes or Pulses". CropsReview.Com. ^ Kurlovich BS, Repyev SI, eds. (1995). The Gene Bank and Breeding of Grain Legumes (lupine, vetch, soya and bean). Theoretical basis of plant breeding. 111. St. Petersburg: N. I. Vavilov Institute of Plant Industry. p. 438. ^ a b "Nutrition facts for Chickpeas (garbanzo beans, bengal gram), mature seeds, cooked, boiled, without salt, 100 g, USDA Nutrient Database, version SR-21". Conde Nast. 2014. Retrieved 15 January 2015. ^ Birt DF, Boylston T, Hendrich S, Jane JL, Hollis J, Li L, et al. (November 2013). "Resistant starch: promise for improving human health". Advances in Nutrition. 4 (6): 587–601. doi:10.3945/an.113.004325. PMC 3823506. PMID 24228189. ^ Sabaté J, Wien M (April 2015). "A perspective on vegetarian dietary patterns and risk of metabolic syndrome". The British Journal of Nutrition. 113 Suppl 2 (Suppl 2): S136–43. doi:10.1017/S0007114514004139. PMID 26148917. ^ Jayalath VH, de Souza RJ, Sievenpiper JL, Ha V, Chiavaroli L, Mirrahimi A, et al. (January 2014). "Effect of dietary pulses on blood pressure: a systematic review and meta-analysis of controlled feeding trials". American Journal of Hypertension. 27 (1): 56–64. doi:10.1093/ajh/hpt155. PMC 5391775. PMID 24014659. ^ Ha V, Sievenpiper JL, de Souza RJ, Jayalath VH, Mirrahimi A, Agarwal A, et al. (May 2014). "Effect of dietary pulse intake on established therapeutic lipid targets for cardiovascular risk reduction: a systematic review and meta-analysis of randomized controlled trials". CMAJ. 186 (8): E252–62. doi:10.1503/cmaj.131727. PMC 4016088. PMID 24710915. ^ Biological N Function in Forage livestock systems. American Society of Agronomy. 1976. p. 42. ISBN 089118046X. ^ Deacon J. "The Nitrogen cycle and Nitrogen fixation". Institute of Cell and Molecular Biology, The University of Edinburgh. Retrieved March 1, 2015. ^ Postgate J (1998). Nitrogen Fixation (3rd ed.). Cambridge University Press. ISBN 978-0-521-64853-0. ^ Smil V (2000). Cycles of Life. Scientific American Library. ^ Soybean in tropical and subtropical cropping systems : proceedings of a symposium Tsukuba, Japan, 26 September - 1 October 1983. AVRDC No.86253: Shanhua, Taiwan : Asian Vegetable Research and Development Center. 1986. p. 57. ISBN 92-9058-0022-6 Check |isbn= value: length (help). ^ Shanmugasundaram, S (1991). Vegetable soybean : research needs for production and quality improvement ; proceedings of a workshop held at Kenting, Taiwan, 29 April--2 May 1991. Taipei : The Center. p. 59. ISBN 929058047X. ^ Sarrantonio, Marianne (1991). Methodologies for screening soil-improving legumes. Kutztown, Pa., U.S.A. : Rodale Institute. p. 15. ISBN 0878579893. ^ Albala K (2007). "Lentils: Fertile Crescent". Beans: A History. New York: Berg Publishers. p. 18. ISBN 978-0-8578-5078-2. The earliest culinary texts to have survived are in the form of three cuneiform tablets dated to about 1600 BCE. [...] [T]ucked away among a series of porridges there is one recipe for husked lentils [...]. [I]n any case it is the very oldest explicit legume recipe on earth. [...] The Egyptians also used lentils as funerary offerings and in meals to feed the dead in the underworld. Large stores were found beneath Zoser's pyramid [...]. ^ Chaudhry M. Green Gold: Value-added pulses. Quantum Media. ISBN 1-61364-696-8. ^ Lazor, Jack (2013). The Organic Grain Grower. White River Junction,Vermont: Chelsea Green Publishing. p. 299. ISBN 9781603583657. ^ Norman, Arthur (1978). Soybean physiology, agronomy, and utilization. London: New York : Academic Press. p. 13. ISBN 0125211600. ^ "Countries by commodity - Pulses (2016)". UN Food & Agriculture Organization. Retrieved 13 June 2018. ^ Christenhusz MJ, Byng JW (2016). "The number of known plants species in the world and its annual increase". Phytotaxa. Magnolia Press. 261 (3): 201–217. doi:10.11646/phytotaxa.261.3.1. ^ Stevens PF. "Fabaceae". Angiosperm Phylogeny Website. Version 7 May 2006. Retrieved 28 April 2008. ^ Judd WS, Campbell CS, Kellogg EA, Stevens PF, Donoghue MJ (2002). Plant systematics: a phylogenetic approach. Sinauer Associate. pp. 287–292. ISBN 978-0-87893-403-4. ^ Magallón S, Sanderson MJ (September 2001). "Absolute diversification rates in angiosperm clades" (PDF). Evolution; International Journal of Organic Evolution. 55 (9): 1762–80. doi:10.1111/j.0014-3820.2001.tb00826.x. PMID 11681732. Archived from the original (PDF) on 2013-10-19. ^ Daryanto S, Wang L, Jacinthe PA (2015-06-10). "Global Synthesis of Drought Effects on Food Legume Production". PloS One. 10 (6): e0127401. Bibcode:2015PLoSO..1027401D. doi:10.1371/journal.pone.0127401. PMC 4464651. PMID 26061704. ^ Cereal and grain-legume seed processing : technical guidelines. Rome: Rome : Food and Agriculture Organization of the United Nations. 1981. p. 43. ISBN 9251009805. ^ Goot, P.van der (1984). Agromyzid flies of some native legume crops in Java. Shanhua, Taiwan : Asian Vegetable Research and Development Center. ISBN 92905800064 Check |isbn= value: length (help). ^ Pest and disease control on legumes, onions, leeks, outdoor salad crops and minor vegetables. Great Britain: Alnwick : Ministry of Agriculture, Fisheries and Food ADAS. 1984. pp. 11–13. ^ Nyvall, Robert F (1979). Field crop diseases handbook. Series: AVI sourcebook and handbook series. pp. 9–22. ISBN 0870553364. ^ Sherf, Arden F.; Macnab, Alan A. (1986). Vegetable diseases and their control (Second ed.). New York : J. Wiley. pp. 79–82. ISBN 0471058602. ^ Roberts, Daniel A; Boothroyd, Carl W (1984). Fundamentals of plant pathology. New York : W.H. Freeman and Co. p. 24. ISBN 0716715058. ^ Humphreys, L.R (1981). Environmental adaptation of tropical pasture plants. London : Macmillan. pp. 32–34, 40. ISBN 0333268202. ^ a b United Nations D. "The International Year of Pulses". United Nations. Retrieved 14 December 2015. ^ "International Year of Pulses 2016 - IYP2016". Retrieved 14 December 2015. "Pulses". NHS Choices. April 30, 2013. Retrieved January 9, 2017. Varshney RK, Kudapa H (December 2013). "Legume biology: the basis for crop improvement". Functional Plant Biology. CSIRO Publishing. 40 (12): v–iii. doi:10.1071/FPv40n12_FO. Wikimedia Commons has media related to Legumes.